Many things in life are easy to forget but one seldom forgets a delicious dish. 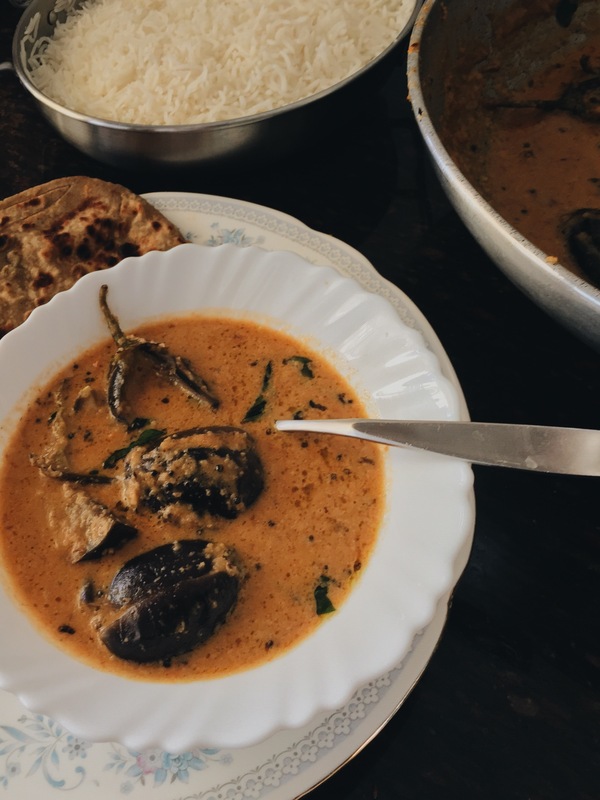 One such dish I found myself recently reminiscing about and relentlessly craving was Hyberabadi Baigan, also known as Bhagare Baigan. 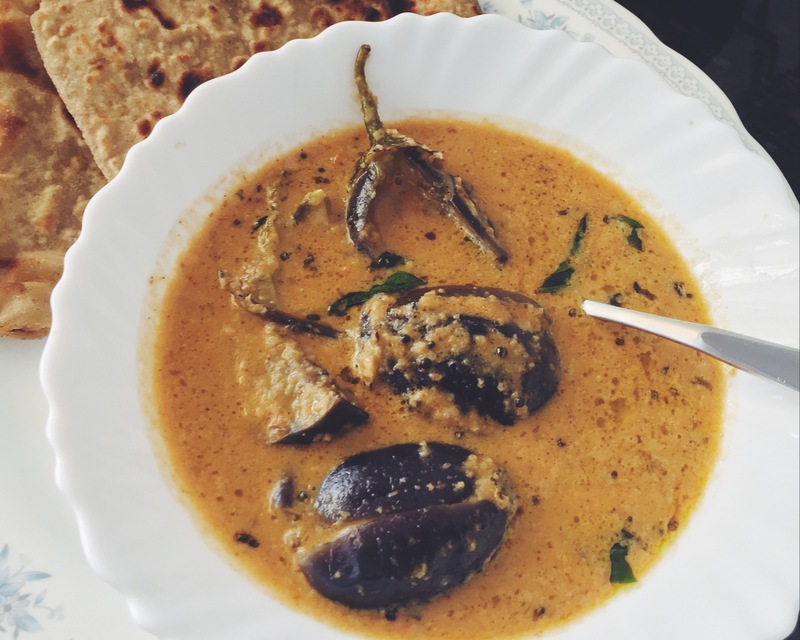 An eggplant curry inspired by flavours from Hyderabad, a former princely state in the southern belt of India. 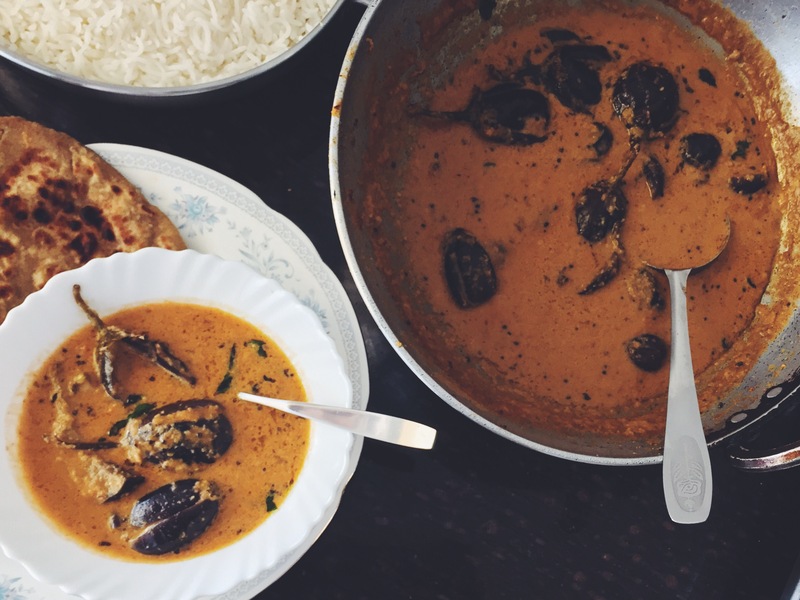 Hyderabadi cuisine has evolved over centuries through local and foreign influences. The key ingredients of Hyderabadi cuisine are coconut, tamarind, peanuts and sesame seeds. While the cuisine is more meat based, you can also find some real vegetarian gems in the mix. Here’s my take on this Hyderabadi classic. To be enjoyed with parathas or rice, every mouthful is lip smackingly delicious. Vegetable oil for pan frying the eggplants. 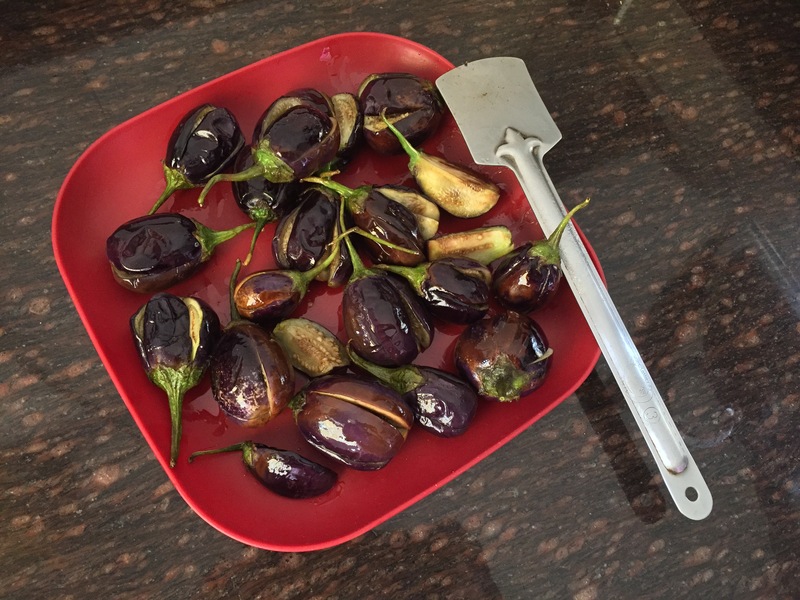 Begin by pan frying the quartered eggplants until they slightly change colour and are soft. Keep aside. To make the sauce, heat oil in a kadahi or a heavy based pot. If you can’t find mustard oil you can use vegetable oil, ghee or olive oil. 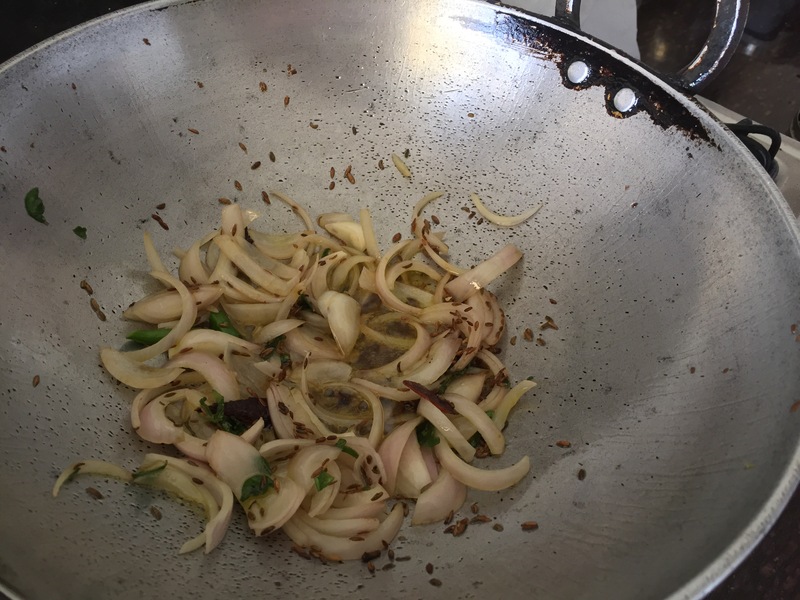 Once the oil is aromatic add mustard seeds, cumin seeds, cinnamon stick and curry leaves. When the spices splutter and are aromatic add sliced onions. Cook until onions are slightly caramelised. Now add roasted peanuts and mix well. 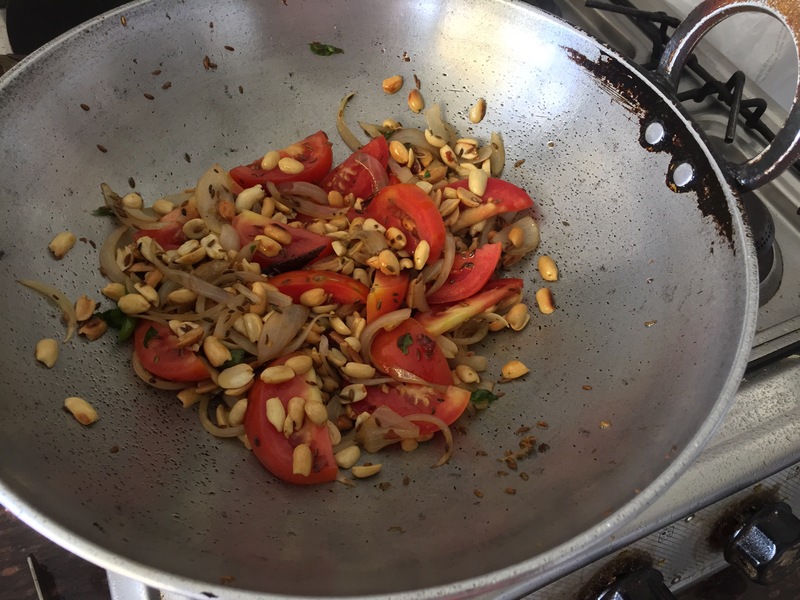 Cook onion and peanuts for about five to seven minutes. Then add the tomatoes and dried spices. Mix well. While the tomatoes soften, soak the tamarind ball in quarter cup hot water. Once soft squeeze the pulp and strain the juice. If you don’t have tamarind you can also use juice of one lemon. Add the tamarind juice, one teaspoon of sugar and two cups of water to the tomato mix. Give the ingredients a good stir. Once it comes to a boil turn the gas off and let the gravy cool. Then blend until smooth. 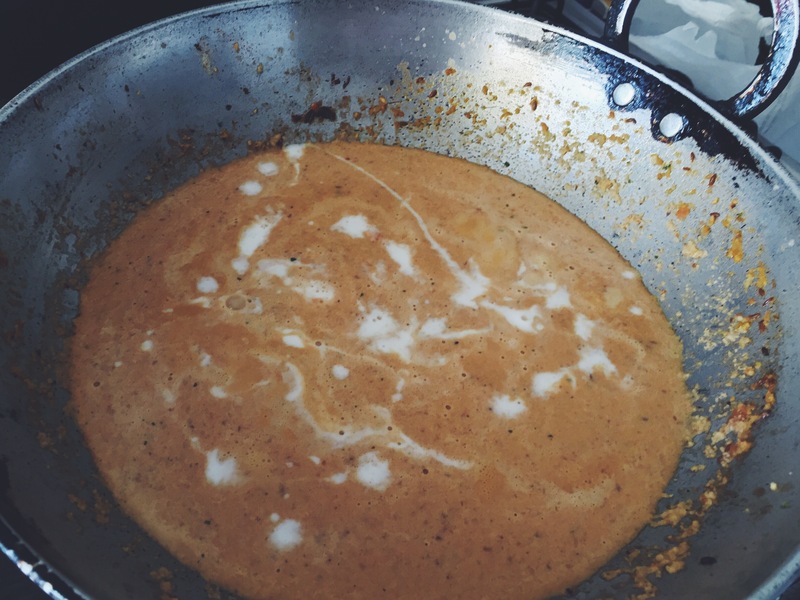 Finally add coconut milk to the gravy, season with salt and cover the pot and let it simmer for 15-20 minutes on a low heat. Now the gravy is ready for the eggplants. Drop eggplants gently into the gravy. Let the gravy simmer again for 10 to 15 minutes so the eggplants soak in all the flavour. 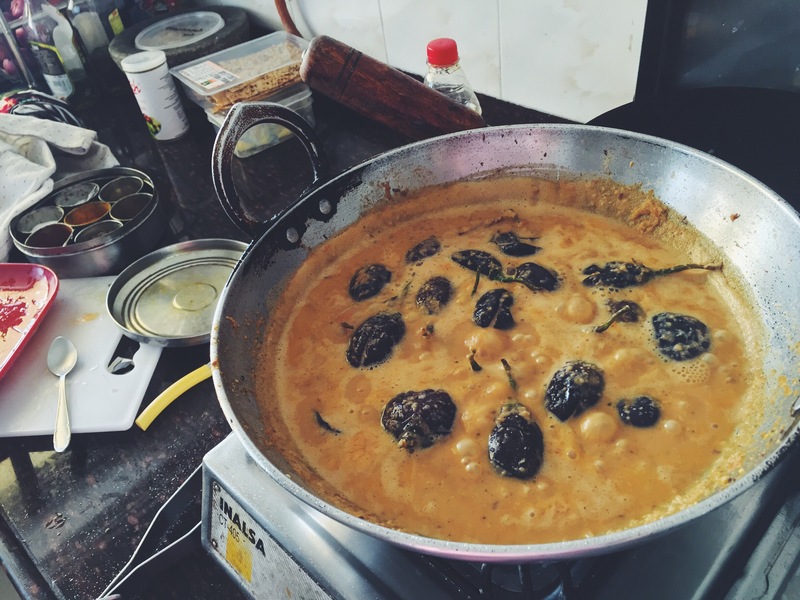 Last step is to add the tadka or temper the gravy with aromatic flavours of mustard seeds and curry leaves. Heat ghee in a skillet. Add mustard seeds and curry leaves. Once they splutter and are aromatic add to the curry and mix well to infuse the flavours. Your lip smackingly delicious Hyderabadi Baigan are ready to be served.